Michelle Wu was all smiles after her election as Boston City Council president. 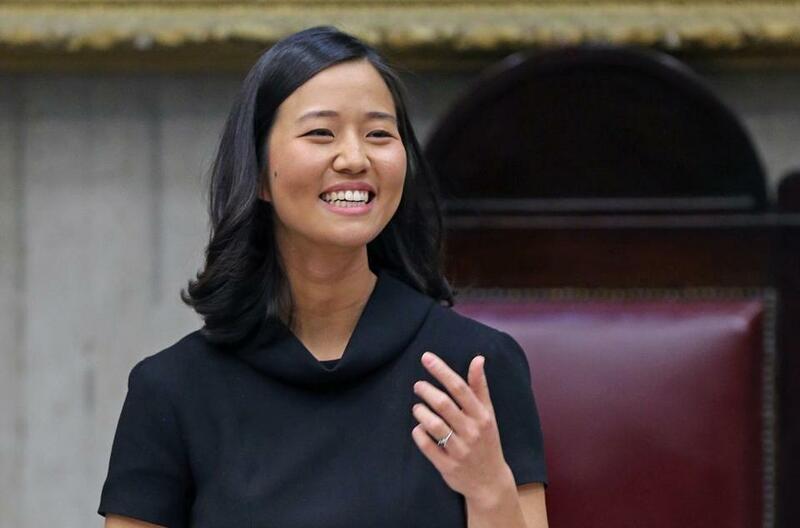 Michelle Wu’s big moment came early Monday morning, as the at-large councilor led her colleagues to the Faneuil Hall stage for their inauguration ceremony. 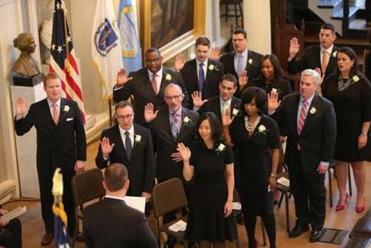 There, they raised their right hands and pledged to serve the residents of Boston. A few hours later, cheers rained down on Wu as she stood on a dais at City Hall and marked her historic ascendancy to the presidency of the Boston City Council. Wu’s presidency is a turning point for the council, the city, and Wu, who in 2013 became the first Asian-American woman to be elected to the council. As she takes the helm, she also will serve as the first woman of color to be called council president. Only two other women have held the post — Louise Day Hicks in 1976 and Maureen Feeney, 2007 to 2008. The 30-year-old Roslindale lawyer ascended to the rostrum after serving just one term. In her inauguration speech, Wu welcomed the two newest members of the council, Annissa Essaibi George, who won an at-large seat, and Andrea Joy Campbell, who now represents District 4, before outlining a bold agenda. She urged her colleagues to work to reduce income inequality, reform the criminal justice system, and improve educational opportunities. Wu, who lives in Roslindale with her husband, Conor, and son, Blaise, said she was grateful for the opportunity to serve and was ready to start addressing issues critical to the city. Geoff Why, a partner at Mintz Levin, said he met Wu when she was a first-year Harvard Law School student. He was overcome with emotion at her election, he said. Why, a fourth-generation Chinese-American, had moved to Boston in 1984 and served in the administration of former governor Deval Patrick. On arrival in Boston, he said, he saw few Asian-Americans. Now they are everywhere, he said. That demographic shift was not lost on him as he watched Wu step into her new leadership role, he said. US Senator Elizabeth Warren, a mentor to Wu and her former law professor, was also in City Hall to share the big day with Wu. She said knew there was something special about Wu the first time she met her. “I’m proud of you, Michelle,” Warren said, and hugged Wu. Wu, a 30-year-old attorney, a new mother, and a community advocate, was raised in suburban Chicago to parents who had immigrated from Taiwan. She came to Boston to attend Harvard College and Harvard Law School. She has been a restaurant owner, legal services attorney, and legal guardian of her younger sister. She also held stints in the administration of Mayor Thomas M. Menino and was the constituency director for Warren’s Senate campaign. She also worked on a measure that guarantees that transgender municipal employees and their dependents have access to gender reassignment surgery, hormone therapy, and mental health services. But Wu also took heat for voting for Bill Linehan as council president two years ago. Although she said she does not regret the vote, some progressives have not forgiven her for it. At the council meeting, Linehan — the oldest councilor currently serving — handed her the gavel. The room erupted in hoots, cheers, and a standing ovation, as Wu beamed. Afterward, a crowd swarmed her, each group wanting to snap pictures with her. Andrew Ryan of the Globe staff contributed to this report. Meghan E. Irons can be reached at meghan.irons@globe.com. Follow her on Twitter @meghanirons.